I have been telling this story in bits and pieces on the blog, on Flickr, on Facebook and even on the radio for weeks now, but I’m finally ready to share the whole thing with you! The story begins way back in the cold heart of winter. I was listening to CBC radio, and they were interviewing a fellow who had a little farm out in Frankville, the other side of Smiths Falls called Kricklewood Farm. He was talking about the goats they raise, the soap they make from the goat milk, and the pressed sunflower oil they make from their sunflower farm. Hmmm, I thought, a sunflower farm. Taking photos at a sunflower farm has been on my photographer’s bucket list for ages. Fast forward to this August when I knew the sunflowers would start to be in bloom. I toyed with the idea of just surreptitiously driving out to the farm and creeping around indiscreetly with my camera, but I figured the best approach would be to ask for permission, so I sent off a little e-mail and hoped for the best. Imagine my delight when I got an e-mail back promptly, telling me that was I welcome to come out to Kricklewood Farm, but that they had a proposition for me. 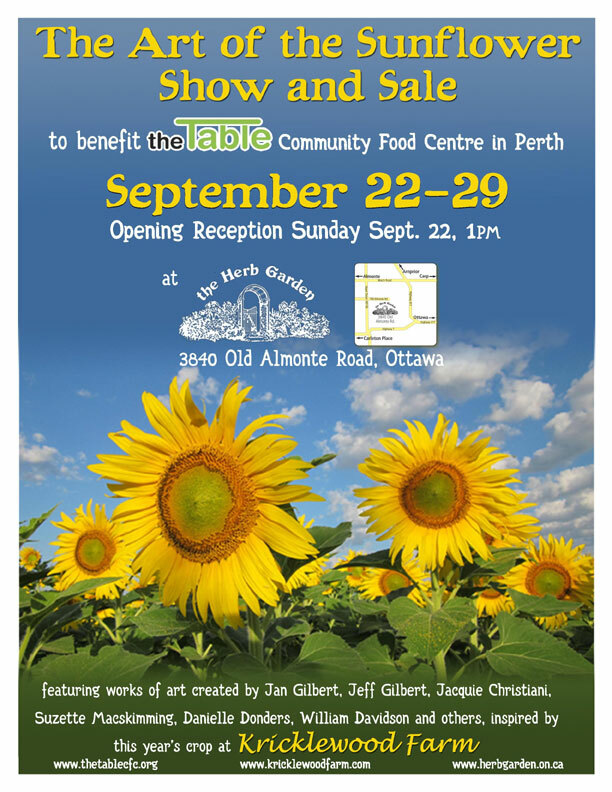 They wanted to put together a fundraiser to support The Table community food centre in Perth. Artists were encouraged to come out to the sunflower field, but asked to donate one version of the resulting work of art to the fundraising auction. How awesome is that? 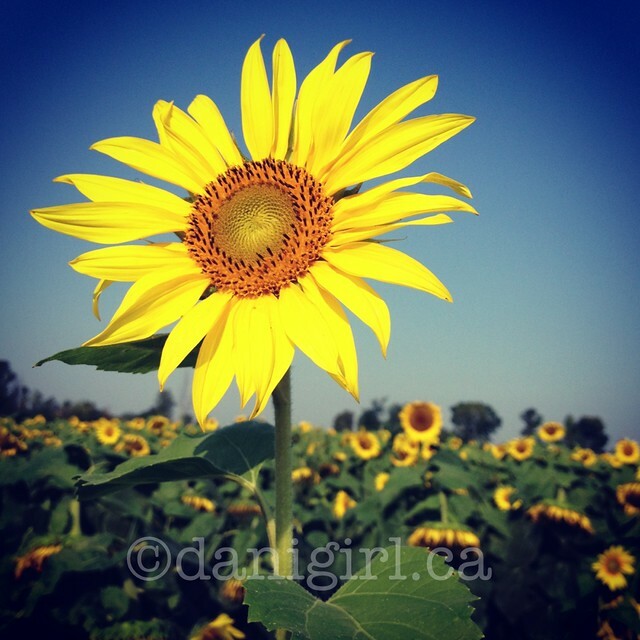 Sunflower photos, a fundraising auction and a healthy supply of good karma? How could I possibly resist? And that’s how this happened to come about! I’m so pleased to be a part of this! I was even on CBC radio’s All in a Day last week talking about it with Dale of Kricklewood Farm. It sounds like there will be photographs, paintings, and even a stained glass window up for auction. I can’t wait to go check it out. And in case you’re curious, this is the work I’ve donated to the auction. I brought my Nikon and took over 100 photos, but the one that spoke to me the most was one I caught with my iPhone and Instagram. I love how it came out on a canvas. Special thanks to Ottawa’s own CanvasPop who always do an amazing job and were kind enough to offer a discount on the canvas since it was for a charitable event. If you’re looking for something to do next Sunday, it’s a gorgeous drive out to the Herb Garden outside of Almonte for the exhibit and auction and it’s for an excellent cause!